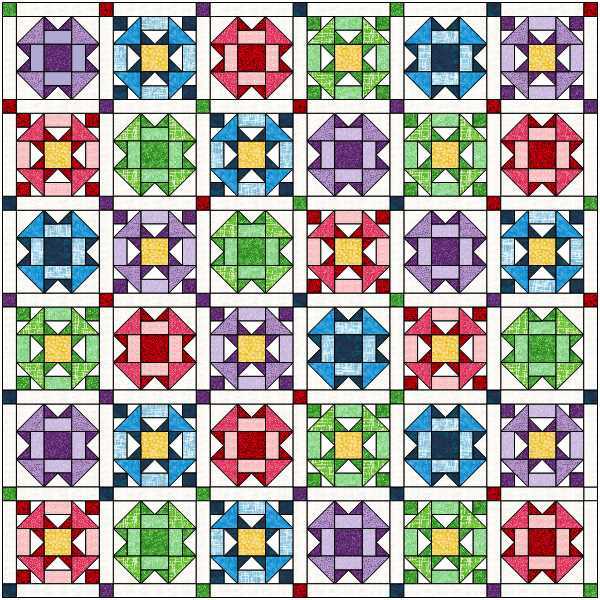 I want to make a quilt using the Folded Corners quilt block. I bought the Wilmington Essentials Soda Pop fabric, and have three shades in Purple, Green, Red and Blue. (light med and dark of each). I don't like the simple layout of this quilt and haven't found any patterns of other layouts. I don't want to set it on point, as it changes the look of the block. I have been playing in EQ8 for the last 2 days with no success. I need some inspiration or help. A good connector block, or special sashing was my plan. I have searched Bing, Google, Pinterest with no luck. Any ideas or suggestions would be greatly appreciated. Thanks in advance! That block is so symmetrical that there really isn't much you can do with it. I drew your block in a 12 inch version and used a large flowered print for the centers of the block, then used the same print as the single border. I also added a 2 inch sashing and picked up a color from the print as the sashing color and used blue cornerstones in the sashing and a blue binding. 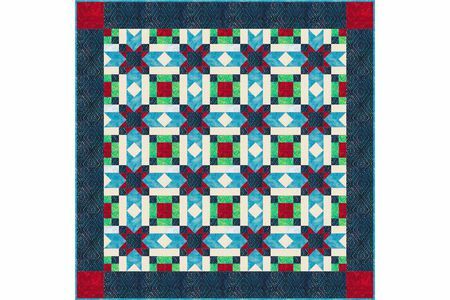 The blue could be a black and it would still add that contrast that your quilt needs. Edited to add: Oops! I alternated the fussy cut centers of this picture. Oh well, I hope you can see my vision even if it isn't perfect. "smile"
Connecting Threads had this in their catalogue a couple of months ago. I love the sashing. I think it really adds to the design. I like the one Barb did above. This block is reminiscent of " hole in the barn door". That would make an excellent alternate block...change the center to a light square, and leave off the points at N S E & W.
Well, after I reread the opening comments, I realized that I was missing a lot of color in the blocks. Not knowing the true colors, I went for the lt, med and dark of the colors mentioned and recolored my blocks. I, also, deleted the border and changed the sashing to a black to help set off the colors. The binding is black too. What do you think of this version? Edited to add: I left the blocks as 12 inch blocks and the sashing as 2 inches. Second edit: And then I thought, what if I made the sashing the same as the background color and just colored the binding and the cornerstones black? Isn't the difference fun? Last edited by Barb in Louisiana; 04-13-2019 at 08:27 PM. ever since Bonnie Hunter's mystery using this block, I've wanted to make something using it. These ideas are both good. thanks for taking the time to do that. It is truly amazing the effects of sashings and cornerstone have on quilt squares! Lots to consider in planning a quilt. Barb is so talented! I love her last version with the white sashing. Opens up the design and lets the blocks breathe! Is this pattern available? I can only find it as a kit. You are all so efficient on the computer than I am. I knew I had seen it before but couldn't remember where. Celtic Mystery did turn out to be a very pretty quilt using the alternating blocks. I like the first one. It's sedate and soothing. I usually don't do sedate and soothing, though. My favorite layout is the one at Connecting Threads. It really pops the colors. Then, my next favorite is the one that's sashed in all black. I think it looses it's continuity with too many non-related colors. When I look at the white sashing with black cornerstones, all I see is the cornerstones. Everyone has different tastes, so choose what looks good to you. Last edited by Barb in Louisiana; 04-14-2019 at 06:09 AM. That's what I love about quilting. It's all about what you end up liking. Often, the final color choices in the blocks will change what I thought I wanted to do originally with sashing and borders. I borrowed Barb's pic to show my idea. I don't have anything to draw it out perfectly like hers. 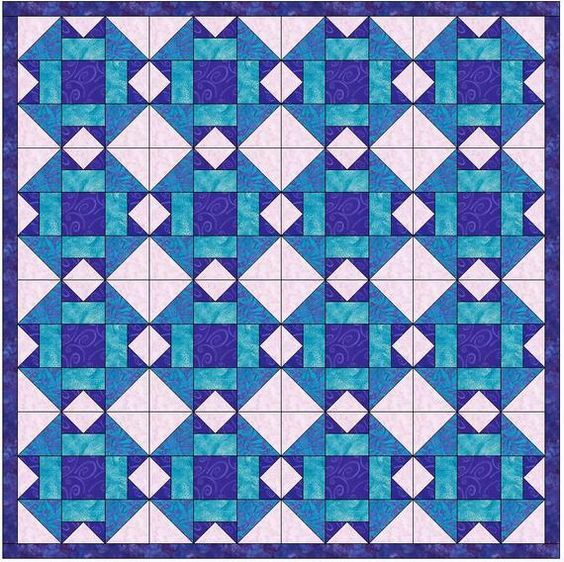 I would make my sashing the same width as the 9 patch square (4 inches) and alternate square in square w/ the hourglass block to make the sashing like this (the is a bit skewed since the sashing in this image was narrow but you get the idea. I love all these renditions! Especially the one with the large flowered border. You all are so talented! These are the two options I have to decide between. I wanted a connector or alternate block of some kind. I liked the simple cornerstone sashing. It does look good with the folded corners block. I was trying for something more elaborate, but sometimes, simpler is better. I really like the sashing on the Connecting Threads version and may change to that idea on the first quilt. Thank you so much for your ideas and suggestions. 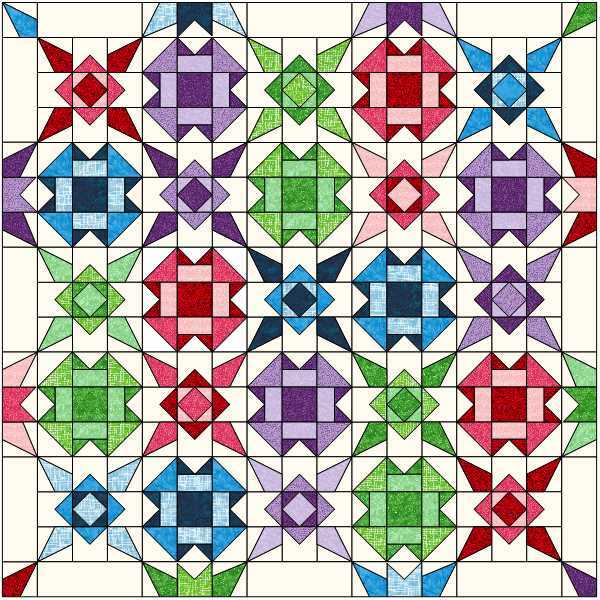 I will try to attach the EQ versions of my quilt designs again. I saved them as JPEGs, so not sure what the problem is. Oh I fell for the first choice, but the second is good too!! Thanks for finding the pattern and, better yet, it is free. Tamaratjo, I like both of your EQ layouts. The second is more traditional looking to me...the connecting chains that will form with the sashing are right up my ally!